Toyota Motor Corp fuel cell Mirai stands on display at the automaker's event on the sidelines of the Shanghai Auto Show in Shanghai, China, in April. TORONTO -- Toyota Canada and Transition Energetique Quebec are going to study the need for hydrogen infrastructure to support the introduction of fuel cell vehicles in Quebec. The two sides on Thursday announced plans to sign a memorandum of understanding to study the market requirements for hydrogen infrastructure. Transition Energetique Quebec was established by Quebec's Ministry of Energy to promote energy transition, innovation and efficiency in the province. The announcement comes weeks after Toyota executives met with Quebec politicians and discussed carbon emissions reductions. During that meeting, Toyota Canada said its first hydrogen fuelling and service facility will be built at its Quebec zone office. 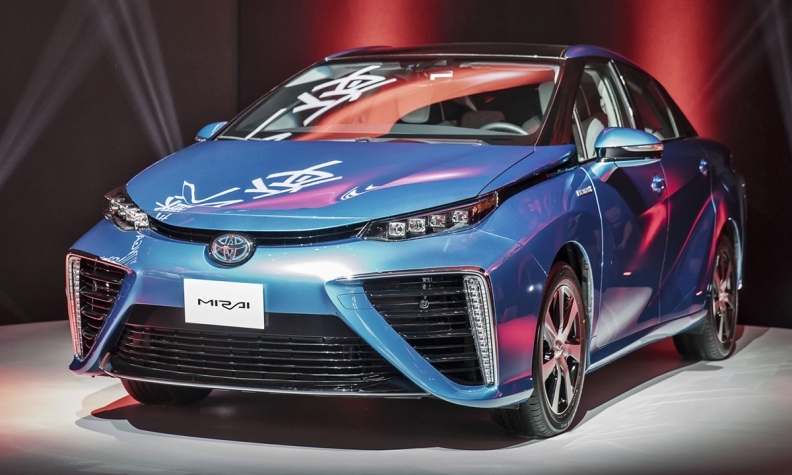 Toyota says its ultimate goal is to offer hydrogen fuel cell technology to Quebec drivers. Toyota is heavily invested in its fuel cell vehicle technology because hydrogen-powered cars like the automaker’s Mirai have superior driving ranges and can be tanked up in three minutes, rather than the hours it takes to charge battery-electric vehicles. It’s the second hydrogen fuel cell announcement for Toyota this month. Toyota and Honda Motor Co. said on Sept. 13 they are collaborating with Shell Oil Co. to install seven hydrogen refuelling stations in Northern California.